Unless you live in a warm climate, you're now facing the reality of training through the cold, snow, ice, and more. Are you one of the brave souls who signed up for a race in late winter or spring? Unless you live in a warm climate, you’re now facing the reality of training through the cold, snow, ice and other lovely conditions that winter brings. As you jog into frigid 25-mile-per-hour winds, you may be wondering what you were thinking. Winter training is doable, as long as you approach it the right way. We asked a couple of pros who live year-round in Boulder for their tips on winter training. With an average low of 22 degrees Fahrenheit and an average snowfall of at least a foot per month from November through April, Boulder is home to winters severe enough that local runners have learned how to adapt. So whether you’re just trying to keep up your running routine or are in dire need of winter training advice, here are the tips you need to keep it going no matter the weather. If you plan out your whole training schedule week-by-week during the winter, chances are the weather has other ideas. It’s important to be opportunistic and realistic when training in the winter. In other words, if you were planning on taking a rest day, but the forecast is predicting warm temps, hit the trails or pavement. On the flip side, if you were hoping to go for a big run and the forecast is calling for heavy snow, it’s not worth risking injury with potentially dangerous conditions. Be rational and take your training to the treadmill. Olympian, triathlete, and founder of Race Ready Coaching Joanna Zeiger admits she’s become borderline obsessed with checking the forecast during the winter. “Over the years, I have become a weather site aficionado,” Zeiger says. She often checks up to three different websites, and as a self-described optimist, plots her weekly training schedule according to the sunniest forecast. Even then, adjusting plans day-by-day is important. “When it comes to training, nothing is ever written in stone, no matter the season,” Zeiger adds. Ewen North, head coach at Revolution Running, agrees. “The winter is ALL about being flexible and creative with your training,” he says. That means occasionally swapping rest days and run days based on what Mother Nature is dishing out, and getting creative with your training indoors. Pro tip: Check out your go-to weather website a week in advance and plot out your training schedule for the next few days according to the forecast. The answer to this question is really up to you, and how comfortable you are with running in the cold. For Zeiger, her low temp threshold is 15 degrees Fahrenheit, but anything below 22 degrees Fahrenheit exacerbates her asthma, so she has to run more slowly. At Revolution Running, the breaking point is a cool zero degrees Fahrenheit. And while you might physically be able to run in zero or colder, at a certain point you need to decide whether it’s really worth it. Will you be able to breathe properly in single digits? 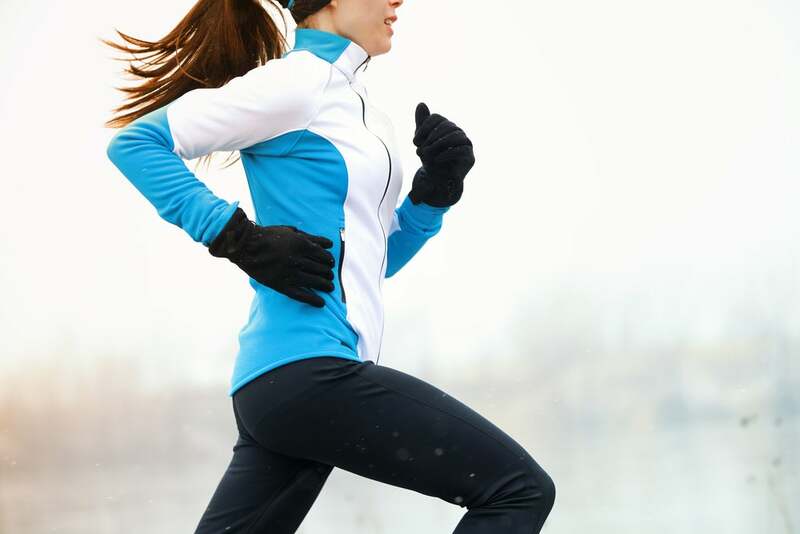 Will you really get a good training run in at 2 degrees when you’re bundled up from head-to-toe? You may find that you need to shorten the run and save the big miles for warmer temps. When you do run in the cold, make sure you’re dressed for it. Layering is key. Start with a base layer, followed by another layer, like a fleece. If it’s snowing, raining, or very windy, throw on a third waterproof/windproof layer over top. For your lower body, go with running tights. An insulated pair lined with wool can help you stay extra warm. Wear a light hat or headband to keep your ears warm, and always go overboard on your extremities. Choose thick wool socks and throw on a double layer if need be. For your hands, choose burly gloves or mittens. Pro tip: If it’s really freezing out, bring along hand warmers and add in a neck gator or balaclava to your get-up. Snow: Invest in a pair of strap-on traction devices for your shoes, such as YakTrax or Ice Trekkers. These work wonders for keeping your grip in powder and even packed snow. They can be finicky, however, by slipping off, breaking, or interfering with your stride, so take them on a trial run before going on a longer one. If it’s snowing heavily, you may have to plan on a shorter run. On big snow days, visibility and staying dry can prove challenging, as can maintaining a decent pace through heavy powder. North of Revolution Running advises that you just do what you can, noting that “a 25-minute run in the snow is better than doing nothing.” Zeiger has even been known to run behind a snow plow on the road to get a clearer surface. Ice: If it’s really icy out, don’t go. It’s not worth putting yourself at risk for injury. Zeiger always opts for a treadmill workout if it’s icy outside. If you’re running on trails, avoid shady areas after super cold days following snow—packed snow plus cold temps equals ice. Mud: A trail runner’s worst nightmare. Shoe-sucking mud and foot-soaking puddles are common on trails that get a lot of sun a couple days after a snow storm. Joining a local online trail forum is a great way to keep on top of trail conditions. Darkness: If you’re training through the winter, chances are you have more than a few night runs in store. Find a training partner (or dog!) so you’re not tackling the darkness by yourself. Always tell someone else where you’re going. Wear a bright headlamp to illuminate your path, and wear reflectors if you’re running near street traffic. And carry pepper spray if you’re running in unsafe areas or in mountain lion territory. Pro tip: Don’t stress about the weather—it’s not worth getting angry over. Just roll with the frigid punches and make the best of it. In ice, whiteout conditions, and serious cold, it’s time to take your run indoors. North of Revolution Running recommends adding an incline of .5 to 2.00 to the treadmill to replicate outdoor running surfaces, warming up for 10-15 minutes, and then using interval training to alleviate boredom. He cranks his pace for a minute, then backs down to an easy stride for 90 seconds, and repeats this ten times, before finally cooling down for 5-15 minutes. Pro tip: Banish boredom with tunes. Zeiger makes a custom Pandora station with a wide mix of genres to keep her motivated. A steam session. Zeiger likes to go straight to the sauna at her gym to soak in the heat. And if all else fails? “I get back into bed,” she says. A long hot shower. That’s how North likes to get his body temp back up, along with a cup of coffee to ward off the lethargy that often sets in after being really cold. What are your tips for training during the winter?